"I don't know if they're waiting for me to die or what, but I'm still here and I haven't given up yet." 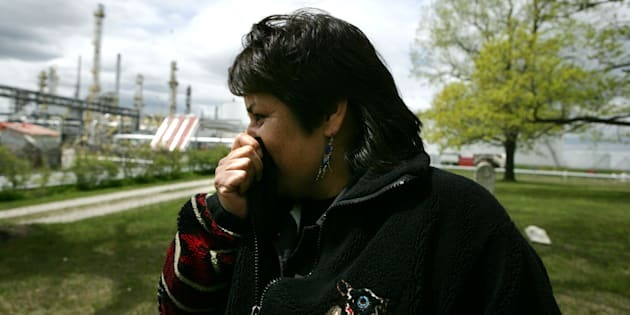 Aamjiwnaang activist Ada Lockridge holds her nose as intense odors pass through the native burial grounds on the reserve across from Suncorp Energy Corporation, Inc. in Sarnia, Ont. in 2008. A resident of a southern Ontario First Nation surrounded by industrial facilities is taking the provincial government to court to demand it complete an air quality review promised eight years ago. Ada Lockridge of the Aamjiwnaang First Nation, in an area known as "Chemical Valley" near Sarnia, Ont., first secured a commitment in 2009 from the Ministry of the Environment to review how air pollution is regulated where there are multiple emitters. Currently, the ministry only considers the emissions of one particular facility when issuing approvals and orders, not any cumulative effects from various facilities. The Environmental Bill of Rights sets out a legal duty for the ministry to complete a review like the one promised to Lockridge "within a reasonable time." Aamjiwnaang activist Ada Lockridge drives her vehicle in a field on the reserve across the street from Lanxess Corporation, a chemical company in Sarnia, Ont., on May 21, 2008. Eight years is not reasonable, Lockridge argues. "I don't know if they're waiting for me to die or what, but I'm still here and I haven't given up yet," the 54-year-old said in an interview. Lockridge submitted the 2009 application to protect all Ontario communities with significant sources of industrial air emissions, but also to protect herself, her daughter, and her community, her lawyer Kaitlyn Mitchell writes in the application for judicial review. "The closest industrial sources of air contaminants to Aamjiwnaang are adjacent to the reserve and across the street from important community institutions," the application says. Aamjiwnaang residents have long complained of high rates of asthma, headaches, learning and behavioural problems in children, and miscarriages. A 2005 study of Aamjiwnaang birth records found that baby girls outnumbered boys by a two-to-one ratio. Tests performed years later by a McGill University professor suggested a possible link to pollution when he found that mothers and children were being exposed to higher-than-average levels of harmful hormone-blocking pollutants. Three years ago, after Ontario's environmental commissioner raised the issue of the — then five years-delayed — review, Environment Minister Glen Murray said he would look into it immediately. The ministry now says its review will be complete and made public this fall. In a statement it noted that data from the local air monitoring station indicates that contaminants have decreased over the period. Premier Kathleen Wynne smiles while listening to Environment Minister and Climate Change, Glen Murray answer a question during the unveiling of Ontario's Five Year Climate Action Plan in Toronto on June 8, 2016. Lockridge is skeptical, saying the one monitoring station doesn't provide enough information, for example what is in the air at a given time when there is an incident at a nearby facility. "They average it out for the whole year so we can't even tell the days it was really bad," she said. "I always have to question a lot of the things they say." Dianne Saxe, the current environmental commissioner, said she has asked the ministry about the review nearly every month for the past year and a half. "For the people who breathe in that community, it doesn't matter where the pollution comes from," she said in an interview. "They are affected by the total level of contaminants." The ministry has been busy lately, implementing two major pieces of legislation on waste and cap-and-trade, Saxe conceded. "I certainly have some sympathy for the ministry staff, who I know are working hard on a very difficult issue," she said. "But when it comes right down to it, eight years is just outrageous."